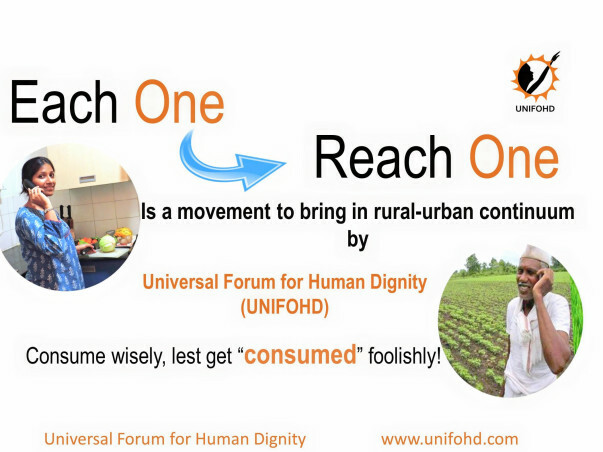 Universal Forum for Human Dignity (UNIFOHD) was founded in 2002 by Guruji Sri. Nandkishore Tiwari, a visionary humanitarian and a realized spiritual master. Each One Reach One is our initiative to bring in rural-urban continuum. It is aimed at directly connecting consumers to the source of their food. 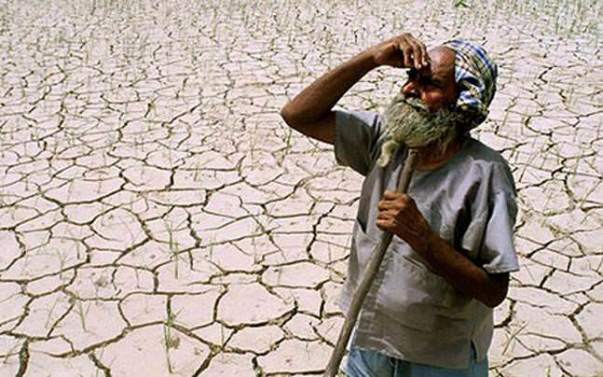 Unmindful usage of chemicals & pesticides along with issues like drought has led several small and marginal farmers to abandon cultivation and move to cities in search of livelihood and income. 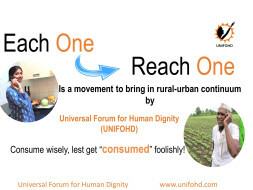 In order to support such farmers and to promote sustainable farming practices, UNIFOHD is soliciting funds from you. Through our workshops and programmes on "natural farming method" farmers will receive support to prepare their land for cultivation and to grow local grains and pulses and thus save soil and water bodies. Awareness campaigns in cities will make consumers shift to buying natural farm produces. As, it is the proverbial last man in the consumer chain, who shapes patterns of consumption and production merely by his choices of consuming. So, our simple choice of consuming the right food can empower the farmer to produce it. Sponsor a field and support us in this initiative. Sponsors are free to visit the fields and to participate in sowing, weeding, and harvesting activities. They will also receive complimentary packages of grains and/or pulses that are grown on these fields.